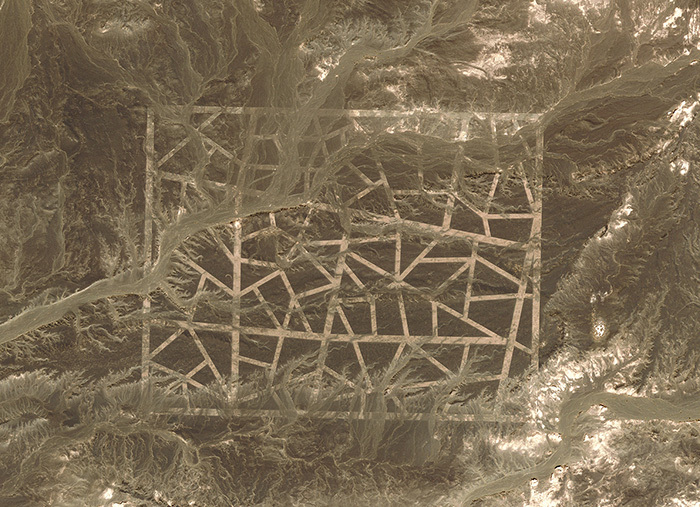 A mysterious structure in the heart of the Chinese desert, an irregular yet precise system of wide, crisply delineated roadways the size of a small town and apparently designed to be seen from orbit. Its discovery on Google Earth immediately launches a thousand Internet conspiracy theories: Missile targeting grid? Extra-terrestrial communication? Simulated street layouts for tactical training? Part of a secret aircraft testing programme? For Exercise (Dunhuang) 2013, Vienna- and Dublin-based artist John Gerrard commissioned a large number of high-resolution satellite depth scans of the area in order to meticulously reconstruct the entire structure and its surrounding lanscape in virtual realtime 3d software. Into this simulation, set wandering along the empty roads and dwarfed by their momumental emptiness, Gerrard places 39 workers from a Ghangzhou manufacturing plant, still wearing the blue uniforms and elasticated paper bonnets designed to protect the electronics they spend long hours assembling. Their shadows contract and lengthen with the course of the virtual world’s diurnal cycle…and they keep on walking. Like the circuit boards turned out by the real workers upon whom they are modelled, and like the virtual landscape they are now embedded within, these are information-intensive, painstakingly assembled synthetic creatures, manufactured by Gerrard’s team of programmers out of thousands of digital photographs, 3d scans and motion capture data. Players on what may equally be read as a gameboard, landscape, or gigantic theatre stage, the workers’ paths are calculated and determined in real time by the system. In a final twist, and returning to the original inspiration for the piece, the ‘pathfinding’ algorithm Gerrard employs is the same one Google Maps uses to find you the optimal route to your destination. When the workers’ paths cross, the one who has travelled the shortest distance is ‘retired’, and sits down on the ground allowing the other to pass. 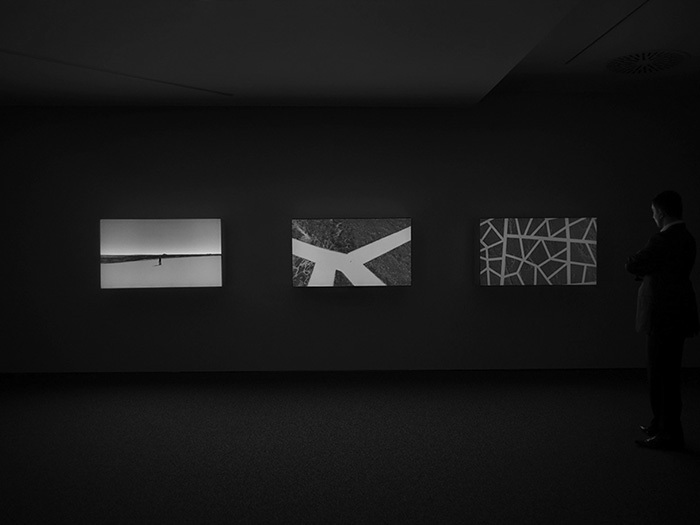 The entire performance (play, game, or exercise) is viewed by three different virtual cameras: from human head height, from the point of view of a circling low-flying drone, and from a satellite’s long-range vertical perspective—making it clear that the viewer of this work is also a new model, a technologically-mediated subject, telepresent, omniscient, yet strangely disconnected; a processing channel for information flows with a possibly violent intent. After a period lasting between 24 and 36 hours, the game ends; the human point of view then passes over to that of the last worker standing, its viewer installed into the first-person perspective of the reigning victor. (Dunhuang) 2013 is the latest in Gerrard’s Exercise series of works, which explore the violence of technology and the optimisation of the human in its relation to discipline and choreographed display. Using the very software that increasingly mediates entertainment, biopolitics, and warfare, Gerrard creates powerful, enigmatic moving images. Not just depictions or recordings but fully formed enironments, Gerrard’s works are both portraits of and microcosms of a ‘real’ world in which simulations are no longer secondhand copies, but are increasingly both engine and autopilot of our leisure, our economy, and even our politics; and in which exercise, rehearsal and simulation are themselves means for the assertion of power. Infinite Freedom Exercise (Near Abadan, Iran), created for Manchester International Festival in 2012, used a giant LED matrix screen to create in public space a ‘window’ into a desert landscape, where an anonymous soldier continually iterated through a vocabulary of body postures drawn from photographs of US military exercises. As well as abruptly introducing the otherwise distant virtual world of remote-controlled violence into the street, the work revealed a strange congruence between the stereotypical gestures troops rehearse in order to shelter from a traumatic impact (in the ‘Live Fire Exercises’ of the title) and the highly-disciplined world of choreography. Gerrard played upon this further in his spectacular collaboration with Wayne MacGregor at the Royal Ballet in 2011, Live Fire Exercise (Djibouti) 2011, which brought real dancers into the same virtual landscape. In Exercise (Djibouti) 2012, Gerrard used the opportunity of working with top athletes in preparation for the 2012 Olympic Games to extend this reflection on human optimisation. Gerrard’s team captured the olympians’ entire physiognomies and physical vocabularies, creating two ‘teams’ of virtual athletes who, prompted by military flares, race in an infinite loop, periodically becoming exhausted and collapsing to the ground, only to begin the apparently futile competition anew as the virtual daylight wanes. What continues to fascinate in Dunhuang is the emergence in Gerrard’s work of a sophisticated method of collage, using high-end digital rendering technology to overlay virtual simulacra of landscapes, people and gestures captured from reality and redeployed outside of the usual cultural forms. For, despite the high-tech production, the restraint Gerrard brings to these eerie, bleak scenes, and the resigned complacency and stereotyped behaviours of their players, recall Beckett’s minimal theatre of exhaustion more than high-budget Hollywood CGI. Indeed, to compile the choreographic vocabulary for Dunhuang’s worker figures, Gerrard collaborated with actor and acclaimed Beckett interpreter Conor Lovett, as well as dancers Esther Balfie and Emmanuel Obeya. At the same time, the digital precision of the works exposes the inherent uncanniness of a matrix of production which makes available the entire surface of the earth, high-resolution reproductions of entire bodies and faces, and libraries of human gestures with which to ‘rig’ them. The cultural products of this virtual treasury tend to veil their productive sources, consigning certain parts of the earth to invisibility and obscuring energy-intensive technological labor beneath effortless virtual surfaces. Gerrard’s works do not take an easy way out of this predicament: they participate in this system even as they nudge it slightly off-kilter. The use of the workers in Dunhuang, one feels, is poised uncomfortably between portraiture and documentary, between advocacy and exploitation, even suggesting a kind of cybernetic exoticism with regard to the ‘inscrutable’ world that feeds our tech habits. Gerrard’s mute figures are distant, virtual abstractions—but in all honesty, no more so (to the average western mind) than their living originals. The combination of the work’s immediately compelling realism and its aloofness and refusal to entertain interactivity reiterates the way in which technology enables us to have the whole of the earth at our disposal and yet, at the same time, to violently distance ourselves from its reality.